Shashi Tharoor was seated on a giant scale, as part of a temple ritual when the accident took place. Lok Sabha Congress candidate Shashi Tharoor, aiming for a hat-trick of wins, on Tuesday sought a probe into a freak accident at a temple near Thiruvananthapuram which led him to have to eight stitches on his head. "My mother, who is 86 years old, said she has never ever heard of the 'tulabharam' breaking. So it's better that a probe is needed to know what happened. The district Congress committee President has already written to the police seeking a probe. Let us know what actually happened," said Mr Tharoor, after being discharged from the Medical College Hospital. The incident occurred at the popular Gandhari Amman temple at Thiruvananthapuram when he went to celebrate Vishu, the traditional Hindu New year. 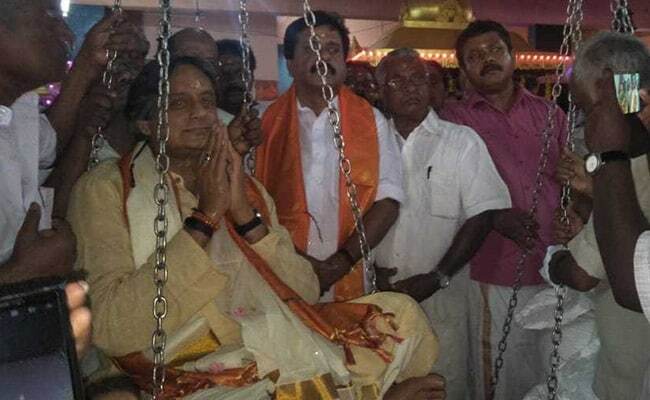 Praying while seated on a giant scale, as part of a temple ritual, the chains holding the balance broke and fell on Mr Tharoor's head. He was rushed to a hospital. On Tuesday, he had a surprise visit by Defence Minister Nirmala Sitharaman. He tweeted this morning that he was touched by Ms Sitharaman's gesture. "Civility is a rare virtue in politics," he posted, sharing a photo with the minister and top BJP leader in his hospital room. Mr Tharoor will be present on the stage later in the day with Congress President Rahul Gandhi. Mr Tharoor is engaged in a three-way electoral battle with former Mizoram Governor Kummanem Rajasekheran of BJP and CPI's C. Divakaran, a sitting legislator and former state Minister. In 2014, Mr Tharoor scraped through with a margin of around 15,000 votes against BJP's O. Rajagopal, who is now a MLA.